The U.S. Coast Guard has suspended its search for a crewmember who went overboard from the Royal Caribbean cruise ship Harmony of the Seas some 267 miles (429 kilometers) off Puerto Rico. 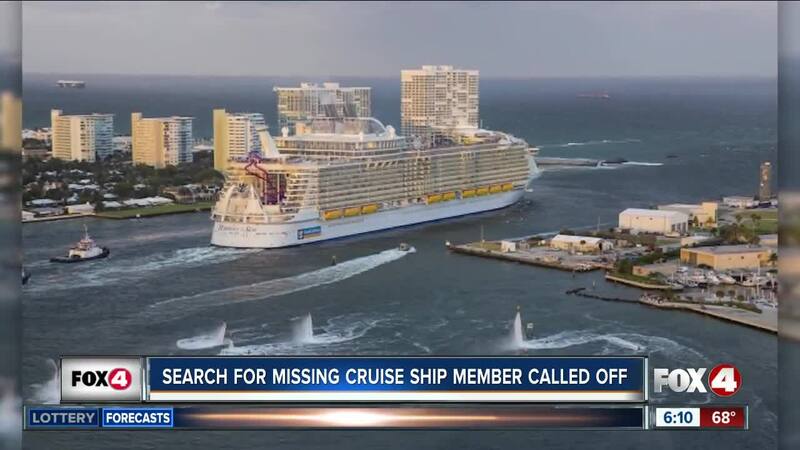 MIAMI (AP) - The U.S. Coast Guard has suspended its search for a crewmember who went overboard from the Royal Caribbean cruise ship Harmony of the Seas some 267 miles (429 kilometers) off Puerto Rico. A Coast Guard news release says they ended the search Thursday afternoon, two days after 20-year-old Arron Hough of the United Kingdom went overboard on Christmas Day . Coast Guard rescue crews were composed of HC-130 Hercules airplanes stationed in Clearwater, HC-144 Ocean Sentry airplanes from Miami and the crew of the Coast Guard Cutter Resolute, based in St. Petersburg. The search covered about 3,707 square miles (9601 square kilometers). Harmony of the Seas sails from Port Everglades in Fort Lauderdale.